Many golf courses offer a driving range, putting and short game practice areas that can help improve your game at a minimal cost. 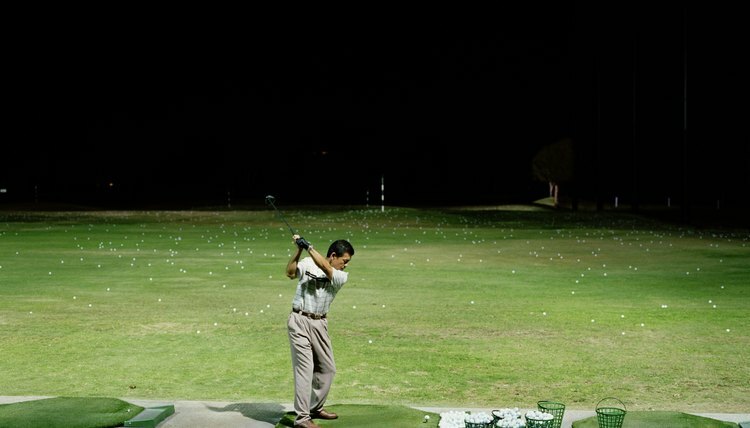 Practicing your golf swing may not be as much fun as playing a round of golf, but players who are serious about improving their game must spend time on the driving range--on a regular basis. You build a dependable swing through practice. The more you practice, the more confidence you gain in your swing. On the practice range you have the freedom to try radical changes in technique because the shots don’t count. The night before you are going out to practice, take out the scorecards from your last few rounds and write down what caused the bad holes you had--the bogeys, double bogeys or worse. You may see a pattern, such as taking two shots to get out of bunkers, or slicing your tee shots into the trees or other trouble. Correcting these problem areas should be the focus of your time on the practice range. Improving your short game is critical to lowering your scores. The difference between a good golfer and a mediocre one often comes down to being able to consistently get down in two strokes from off the green or from a bunker. But if you observe golfers at a practice facility, you see that most of them spend very little time working on pitching, chipping and putting. Next time you go out to practice, make sure you devote at least one-third of your time to working on your short game. Your goal on the golf course is to produce shots with both distance and accuracy. On the practice range, golfers often mislead themselves by just focusing on how far the ball is going. They hit a half dozen long drives and conclude they are swinging well. When they get on the course, they wonder why half of their drives end up in the rough. Carve out an imaginary corridor on the driving range that is the average size of the fairways on the course you play. Aim for the center of the corridor and track how accurate the shots are. Aiming for a target will help you correct any swing or alignment problems before you tee off. Professional golfers take their practice time very seriously. They concentrate almost as hard as they do when they are on the course. Amateur golfers often waste their time on the practice range by watching other players, chatting with their buddies, or just mindlessly hitting balls without even taking the time to aim for a target. Tune out distractions and focus on hitting shots with the same precision you are seeking when you are playing an actual round. Your improved ability to concentrate when practicing should carry over to the course. While golfers are practicing, they often discover subtle swing changes that produce noticeable improvement in the quality of their shots. They might find a temporary groove where they hit 10 great shots in a row. Don’t depend on muscle memory alone to recall these valuable new swing keys the next time you play. Keep a pocket-sized journal in your golf bag. After each practice session, write down the most important things you learned. Before the next practice session or your next round of golf, refer to the journal, which should help you make these new techniques a permanent part of your swing.